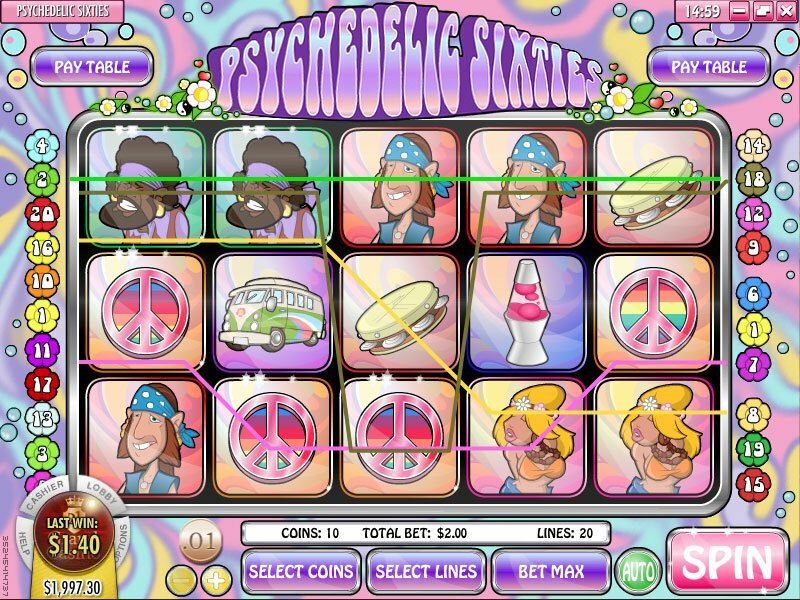 Psychedelic Sixties slot machine is a great game for the nostalgic gamers looking to reconnect to their glory days. Everything about this slot machine reflects the deep change that swept the world in support of peace, freedom and openness during the sixties. On the other hand, the experience could be immensely improved if a bit more attention were paid to visual and audio quality. Hey man, are you coming to that forest festival this weekend? There’s going to be peace and love and lots of groovy chicks. I’m going in my van man. I’m gonna pick up people from all over the world and take ‘em. It’s gonna be like, a crazy gathering of flower children from all in my van with music and groovy chicks. Don’t waste your money on food man! Love will be all the food we need. It’s the hippy golden age again in Rival Gaming’s Psychedelic Sixties slot machine where everyone’s chillin on their way to an awesome jam fest. 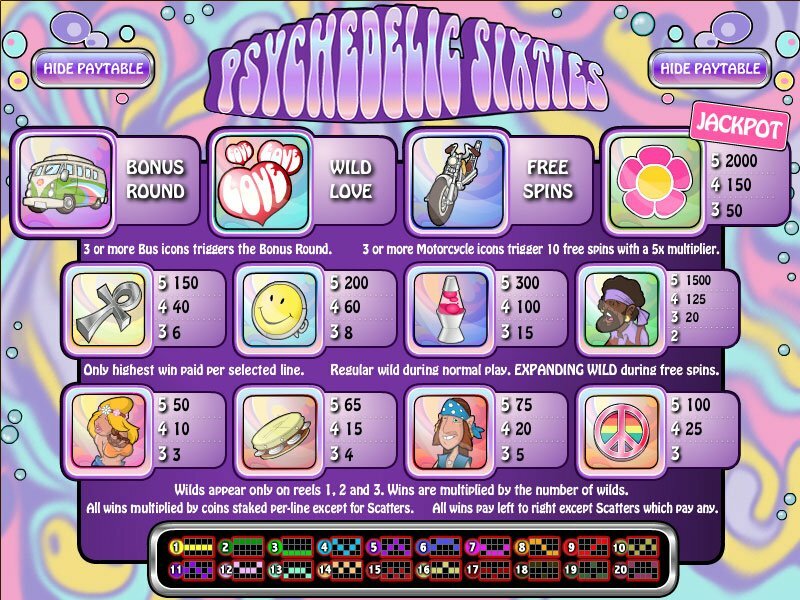 Psychedelic Sixties slot machine is an i-Slot from Rival Gaming which means greater amusement than an average video slot machine by way of an involved story line and slowly unfolds with each spin of the reels. The visuals of the game are certainly nothing to shout about except perhaps in audible disappointment. 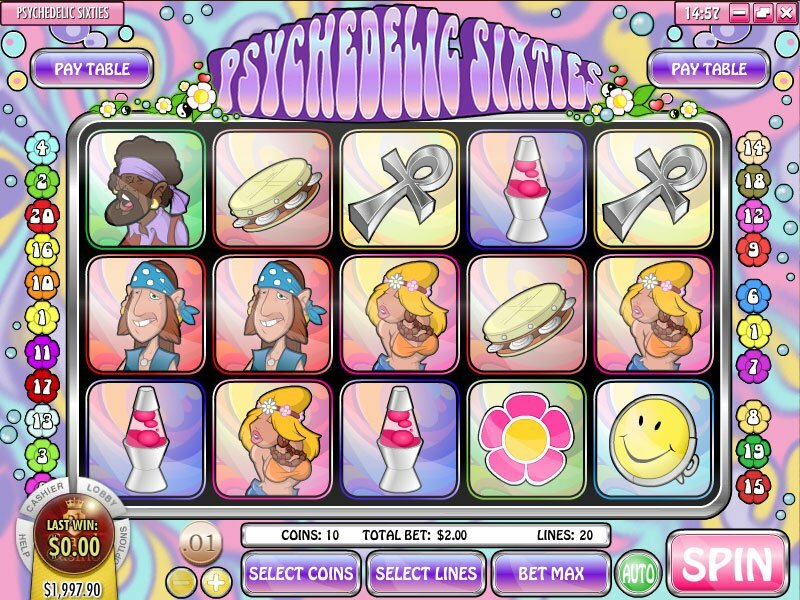 Psychedelic Sixties is built like any other slot machine. With 20 pay lines, quite the psychedelic background, and rimmed with bright flowers, spinning these reels is never boring. In fact the only boring thing here is monotonous sound of the reels spinning. With a lack of background music, this sound is all you have to focus one and it gets old really fast. The pink flower wins you the most money and five in a pay line will win you a Psychedelic jackpot while the love hearts are wild and the motorcycle symbol will send you free cruising with free spins. The true magic of the Psychedelic Sixties slot story begins with you get three groovy vans anywhere on the reels. This triggers the bonus round and sends you across the globe city by city picking up freedom loving friends on your way to history’s biggest rock concert ever. The visuals of the game are certainly nothing to shout about except perhaps in audible disappointment. Psychedelic Sixties slot machine functions as smooth as they come, but the art and animation is overly simple though bright color is used well in the design for create quite the Hippy effect that Rival Gaming must have been going for. Audio quality is also relatively poor and simple. As mentioned before, no background music keeps up the mood and some of the sound effects are annoying rather than entertaining or stimulating.